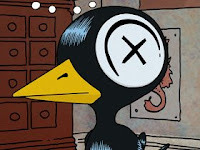 Booze News: The Drinky Crow Show Season 1 Starts Sunday! Attention all drunken, suicidal crow lovers! 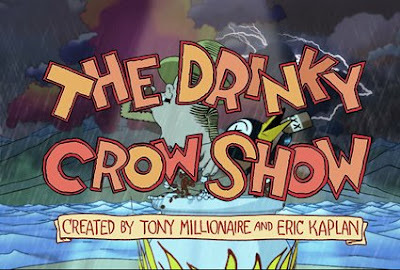 On Sunday night (or early Monday morning depending on your time zone) the first season of The Drinky Crow Show will premiere at 12:15 A.M. EST as part of Cartoon Network's Adult Swim line-up. Back on May 13th of 2007, Cartoon Network aired a pilot for the series, based on Tony Millionaire's underground comic strip, Maakies. Apparently the ratings and viewer feedback were sufficient to encourage the network suits (or perhaps grubby t-shirts) to order an initial five episodes of the program. If you can't wait for Sunday's airing, keep an eye out on the official Adult Swim Drinky Crow site. Episodes often appear online before the official air date. The 2007 pilot is also available for viewing if you missed it the first time around. The era of the theatrical short subject faded to a close in the late 40's and early 50's, as double-features and gimmicks (Widescreen, Cinerama, 3-D, etc.) replaced the block of programming that had once been standard fare in studio-owned theater chains. However, the soused cinema short is not dead. It simply has a new venue -- funnyordie.com. Creator Derek Waters and filmmaker Jeremy Konner have produced a series of very funny short films in which individuals tell stories from American history after getting hammered on hooch. As the partly lucid narrator spins the tale, the historical events are reenacted by the likes of Michael Cera as Alexander Hamilton, Jack Black as Benjamin Franklin, and Danny McBride as George Washington. These alky auteurs have produced five Drunk History shorts thus far, all of which are embedded below. I've also posted a link to the Drunk History page on funnyordie.com under my "Drink Links," in the hopes that more Drunk History is yet to come. 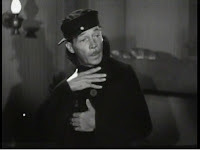 The great, drunken character actor Arthur Housman is the title spook that haunts Laurel and Hardy in the 1934 short subject, The Live Ghost. As in his previous pairing with the popular comedy duo, Scram! (1932), Housman was given more screen time in The Live Ghost than his specialty act was normally afforded. In this case, Stan and Ollie may have been generous to a fault, because Housman staggers off with the lion’s share of the laughs in the 21-minute short. As the film begins, a gruff sea captain (Walter Long) barrels into a bar looking for a crew to man his ship; but the barflies refuse to take him up on his job offer, because they believe the vessel is haunted. Stuck with only a single, perpetually soused sailor (Arthur Housman), the captain enlists Laurel and Hardy to help him shanghai a crew. The boys actually manage to abduct the denizens of the bar, but in the process, they end up shanghaied themselves. Only through the captain’s threats are the boys spared the wrath of the rest of the shanghaied seamen; so when the crew are eventually granted shore leave (with the exception of the drunken Housman), Stan and Ollie refuse to join them, preferring the safety of the ship. Since the boys are staying aboard, the captain puts them in charge of making sure that the drunk doesn’t sneak off the ship to grab a “teensy weensy.” Of course, the hooch-hound is determined to elude his guards, and falls into a tub of whitewash during his attempted escape. 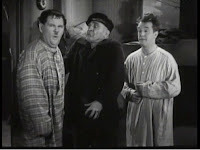 Covered in paint, the boozer bedevils Stan and Ollie, who take him for one of the ship’s ghosts. The Live Ghost is not one of Laurel and Hardy’s best efforts. The plot is a convoluted mass of coincidences, designed to set up the situation for the fright comedy ending; and the physical gags are not as inventive as one usually expects from a Laurel and Hardy short. Still, the film isn’t the boys’ worst work either. It’s a mediocre Laurel and Hardy comedy, but that sets it on a higher plane than most of the work of The Three Stooges or Abbott & Costello. The real saving grace of the film is Arthur Housman. His inebriated antics enliven every scene in which he appears, and for once, he is given almost as much screen time as the stars themselves. Housman could slur and stagger like nobody else, so having the rare opportunity to see his “drunk act” at the center of the action is reason enough to recommend the film. Potent Quotables--CAPTAIN: Hey! Where d’ya think you’re goin’? DRUNKEN SAILOR: I’m goin’ ashore and get a little teensy weensy (winks). Video Availability--You can find the short on DVD in the United Kingdom, Germany, and Holland, but it has not been officially released in the U.S. However, a collector's copy is available on DVD in Laurel and Hardy Classic Shorts Volume 1 (Hollywood's Attic). Similarly Sauced Cinema--Arthur Housman also provided comic support to Laurel and Hardy in Scram! (1932), The Fixer Uppers (1935), Our Relations (1936), and briefly in The Flying Deuces (1939). Booze News: Rick Moranis tells Dave Thomas to "Take off, eh!" You hoser! According to The Canadian Press Rick Moranis has decided against lending his voice to the new Bob & Doug McKenzie animated series. Dave Thomas will still be voicing Doug, but Dave "Full House" Coulier will be filling in as Bob. This turn of events is not entirely surprising. Earlier this year, Moranis stated that he would not be participating in a possible Ghostbusters III. Apparently, he made a killing on the Honey I Shrunk the... movies, and he no longer has to work. The Canadian Press article linked above does mention that Moranis will keep executive producer status on the new show, but it is unclear if he will have any real input. 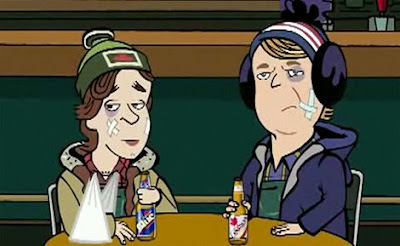 For more info regarding the upcoming series, you may want to keep an eye on World of Hosers. A Star Is Born (1937), the story of a Hollywood starlet’s (Janet Gaynor) rise with the help of a declining, alcoholic actor (Fredric March), was remade twice--first in 1954 with Judy Garland and James Mason, and yet again in 1976 with Barbra Streisand and Kris Kristofferson. However, the 1937 original was itself a reworking of an earlier picture, What Price Hollywood? (1932), from the same producer, David O’ Selznick. 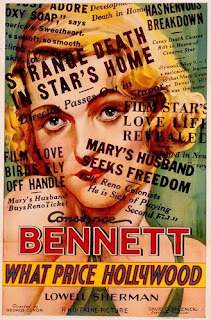 The 1932 film tells the story of Mary Evans (Constance Bennett), a sassy Brown Derby waitress whose life changes overnight when a pie-eyed movie director (Lowell Sherman) staggers into her restaurant. Having forgotten to pick up his date for the premiere of his new picture, the amiable inebriate invites the waitress to accompany him as a substitute. Mary manages to persuade her new friend into giving her a walk-on role in his next picture; and before you can say “montage,” Mary has become a colossal star, promoted by the studio as “America’s pal.” Of course, success comes with a price. Mary finds that her career interferes with happiness in other areas of her life, while her alcoholic mentor slides deeper and deeper into the bottle. Not only was What Price Hollywood? the first version of the A Star is Born; it is also the best. Produced before the Hayes censorship code diluted studio output, the film is a fresh, potent mix of drama, comedy, booze, behind-the-scenes glitz, and scandal. All of the pitfalls of screen stardom are covered in the brief 88-minute running time--gossip rags, promotional hype, rabid fans, marital woes, and even the paparazzi--but despite the soapy subject matter, the movie rarely descends into melodrama. Smart-alecky dialogue by Bundy Drive Boy Gene Fowler helps to keep the atmosphere light; and director George Cukor propels the material forward at a brisk pace (with the help of some well-edited montages). The performances are also first-rate. Forgotten actor (and real-life director) Lowell Sherman is a delight as the perpetually pickled filmmaker Max Carey; and Constance Bennett is equally engaging as starlet Mary Evans. The script requires both of their characters to evolve dramatically over the course of the film, and the actors pull off the comedy and drama with equal aplomb. More than 75 years after its premiere, What Price Hollywood? remains an intoxicating entertainment. This fizzy forgotten cocktail deserves to be rediscovered. 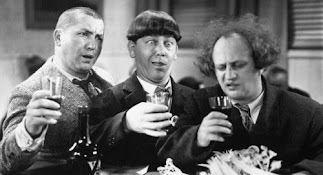 Potent Quotables--MARY: Why do ya drink all the time? Can’t you cut the heavy swilling? MAX: What, and be bored all the time? Video Availability--The film has not been released on DVD, but an out-of-print What Price Hollywood [VHS] (Turner Home Entertainment) was previously released. The film is also shown occasionally on television on TCM. Similarly Sauced Cinema--George Cukor got another crack at similar material when he directed the 1954 remake of A Star Is Born.